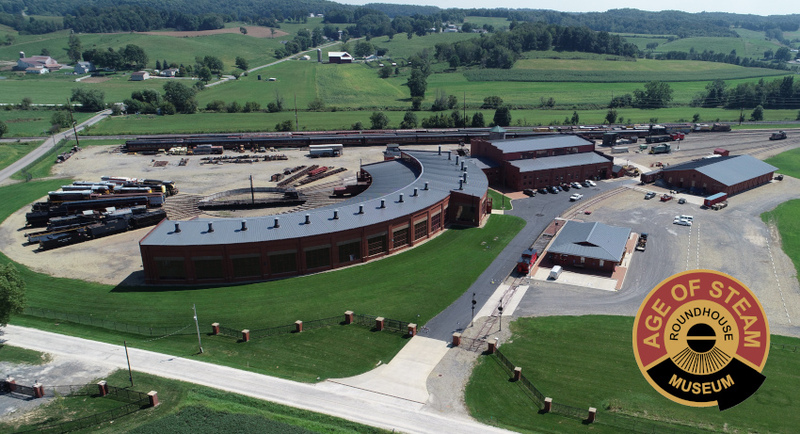 Visitors to the Age of Steam Roundhouse in Sugarcreek, Ohio will experience an immersive trip back into the heyday era of steam locomotives and travel. Highlights of your guided tour are: an 18-stall, accurately reconstructed brick roundhouse surrounding a 115-foot turntable and turntable pit, the first full-sized, working roundhouse built in the U.S. since 1951, the largest private collection of steam locomotives in the world, including 22 historic steam locomotives in various states of restoration and preservation and a fully functioning, working back shop where skilled Age of Steam Roundhouse staff actively continue to preserve, restore and repair steam locomotives. Additionally, visitors will discover the tools used to keep locomotives on the rails, the bells, whistles and lights that made these engines unique, and much more. Public tours will be offered Thursdays, Fridays, & Saturdays (May thru October). 1.5 - 2 hour guided walking tour of the Roundhouse and Shop Area. Due to the nature of the site, visitors are restricted to the tour itself. Each tour group has a maximum of 30 visitors with one tour guide and an assistant. We recommend the wearing of comfortable, closed toe, footwear. We are not currently offering train rides or excursions. Group tours of 20 or more may be arranged by contacting the Age of Steam Roundhouse offices directly.